Reader Devasahayam wanted to know whether the old Beypore Railway Station exists any longer. Sadly, the building has disappeared long ago, leaving only a large fresh water well which was dug for supplying water for the steam engines. Fortunately, we have an old photograph of the Beypore Railway Station furnished by another reader, Calicocentric. As he explains, this photograph used to be on the British Library Museum site but has somehow disappeared from there. We thank Calicocentric and reproduce the photograph, acknowledging the copyright of the British Library Museum. 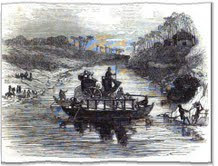 Premnath has furnished another priceless photograph of the stagecoach crossing the Dharmadom river with passengers. Here it is! priceless photographs. Thanks to you to have taken the trouble of locating them. Thank you, PNS. As you may have noticed, both the priceless pictures were contributed by readers of the blog. We thank them for the pains! The Beypore railway station was actually at Chaliyam on the other bank of Chaliyar. Logan himself mentions about this erroneous usage. When the railway was extended to Calicut, they decided to build the bridge across Chaliyar at Feroke, probably because it is the narrowest point of Chaliyar near Beypore. The present day Kadalundi - Chaliyam road is on the track bed of the abandoned Kadalundi - Chaliyam railway line. The river (at Beypore) is still crossed in boats as described in 'The Asylum Press'. Many thanks, Avenarius for clarifying the possible ambiguity and linking it to the earlier post. Careful readers like you keep us on our toes! !Thanks, once again.